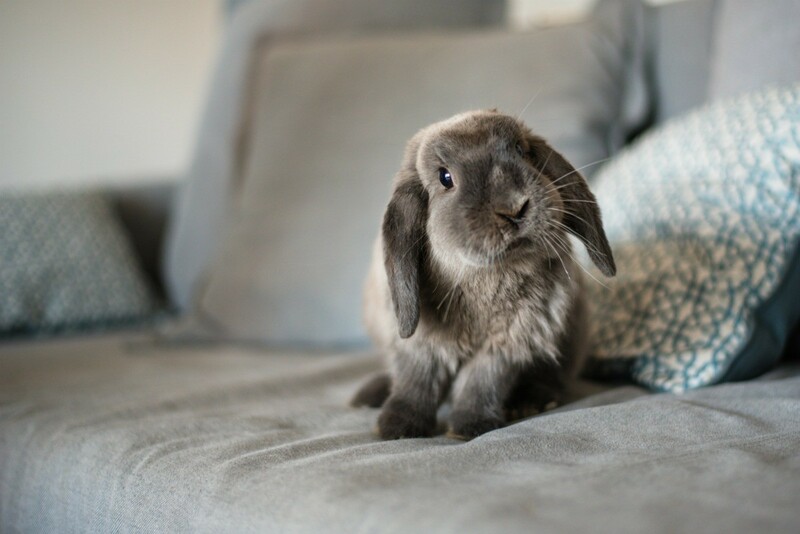 If you are considering getting a house bunny check out the very detailed information, in this guide, from the keeper of a Dutch bunny. This guide contains tips for a house bunny (and mice). 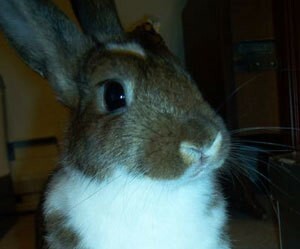 When we first were given our house bunny years ago, I did my homework only to find that the main bunny info sites were giving out way too much info to help fund the vets who specialize in bunnies (none are ever local and cost a fortune as "specialists") and no info that truly helped the owner. So, having had two other bunnies before, I learned the hard way. Bunnies cannot digest ANY form of grease including oils, butter, cheese, or milk. They get a sweet tooth very easily, so seldom give them sugar and only natural fruit or applesauce. If we run out of food before grocery time, I feed him a leaf of any green veggie I have, such as celery or cabbage. He drinks about 3/4 cup of water per day, too, from an overhead waterer. He gets only grumpy occasionally if we forget his food, or try giving him something new (peas, cabbage, broccoli). I have heard that each bunny likes a slightly different diet, but I suggest that you do not experiment too much, because there are more things that harm them than not. Most plants of any sort in the house and yard are poisonous to bunnies and kids. My lawn is all organic, so I occasionally feed him a carefully inspected and shaken bunch of Bermuda grass, young willow or apple twigs/leaves, and dandelions (his least favorite of the three). This is the only variation. Lettuces are OK in small amounts for a snack only, but not as a meal, at all. Too much causes diarrhea. Some folks run their legs off feeding their bunnies because they eat all day long, by nature, but with the pellets he's content, and does very well with once a day feeding, as long as there's pellets to chomp in between. The pellets from the pet store have vitamins that help keep him well, too. He likes bananas, but they draw fruit flies, so we don't give him bites of it much. It costs only about $4.00 per month to keep him inside. He can never go outside because house bunnies do not have the same immune system as field or outdoor rabbits. He is about 5 years old now, and is only about 8 ounces in weight, about 14 inches long, and 6 inches tall at the natural hump in his little back. I have been very careful to feed him only fresh veggies. I also found bargain veggies for him at the Mexican markets, but buy only limited things, like 3/$1.00 cilantro/parsley bunches a week. They don't seem to need pesticides or to be organic. We built a waist high, new wood fencepost wood frame for his cage, and placed it in my grandson's room. It makes it easy to reach and clean. The wood and newsprint help keep the odors way down when freshened daily. He loves cartoons, scratching around the ears and purrs lightly like a cat when happy and in our lap. He cuddles a lot against our cheeks, loves to be brushed gently and often, especially in the spring when he sheds his winter fluff, (they cannot spit up hairballs, so must be brushed). Long haired bunnies are more of a problem than the Dutch ones. He also loves any massages, between my knees, as we are willing to give him while watching the TV. House bunnies will eat electrical wiring, string or rope of any kind, only because it feels good to their teeth, like a teether. They will let out a loud shrill scream if about to die. They can die of a heart attack and quickly, if overheated, over-played, or scared! Their flesh is easy to cut and must be repaired by a "bunny vet", so we don't let our bunny get into any dangerous, for him, situations, and we make certain the cords, ropes, and strings are all too high for him to reach. They can jump off/on the sofa, and when allowed to roam free, get very happy and double-kick in the air like a little goat/deer. They can hide in closets, under beds, behind pianos, or dressers for hours, so don't let them get out of your sight if you have a cluttered home such as I have! Do not pat your hand on the floor hard, because this is their "danger" or "angry" signal, by nature. Learn about bunnies before you think you already know about them. Don't let a young child hold them because they have long claws like a dog, which can scratch skin if the bunny is not held like he hops, rather than upside down, which hypnotizes him into a bad state of being. He must not be made to lie on his back in your arms for more than 5 minutes or he can lose consciousness, I am told, because it causes the blood to leave their brains or something. Hold a bunny like a baby on your shoulder or like a log in your arms, side to side, not balled up like a cat likes. They are afraid of getting their front or hind paws caught on/in something, so watch and help them not to get into such a situation. His cage has a 2 inch high lip at the door to prevent him from jumping when the door is left open a short while. After holding, quickly and carefully allow an adult to return the bunny to his cage because the minute they see it, they want to get there and feel as if they are fighting to get in, wiggling furiously. This is only the fear of falling when held around the middle in mid-air. Better to always hold them securely and firmly with two hands around the middle, so as not to give the fear of falling. Vandy used to make sounds, sort of short little grumpy ones, until we got him the little stuffed squirrel "girlfriend". He will follow our hand around in the cage, or our feet wherever we go, but marks new territory with his own pelletized "gifts", and should only get limited time on the floor (10 minutes, 2-3 times a day, otherwise he misses his bedding and will pee on whatever he's on because he cannot help it.) He's very predictable, does not bite, although he can, as his only defense, if he thinks he's falling, since he cannot hold on to anything with his paws or feet. He offers my grandson so much pleasure and company that he must hold him several times a day. He is assuming the responsibility of taking care of his pets this year, with prompting, but little to no complaint, once he knows how and gets into the routine. Since bunnies can catch colds from humans, we wash our hands before and after handling him. We do not handle him when we have a cold, cough, or sniffles, to prevent him from catching it. We were told they cannot catch things from humans, but we know they can because they are often used in experimental labs for all sorts of human tests. He's never been sick, because we do not take the chance. About once a month he sometimes needs his little bottom cleaned, so I sit his back side only down into a shallow amount of warm water in the bathroom sink and let it soak a minute then wash him with my hand and a tiny amount of Ivory bar soap and rinse the same way. He's happy to be cleaned when he needs it. The reason for the shredded/crumpled paper in a bedding/waste box is so that he can keep himself cleaner and the scratchiness of the paper helps him to be wiped when he turns in the bedding. The urine drips past the pile of crumpled paper strips and falls to the underlining of newsprint layers. He got a vicious tiny Recluse spider bite when we took the advice of the on-line house bunny site's suggestions to feed him straw (the spider was hiding in it from a bale, a big mistake to buy.) I used an animal/human medication called "Draw Out", from Walmart and peroxide several times a day, wrapping his ear inside the toe of a baby sock with tape, which he didn't like, but it held until the next day, most times and got him well. The bite almost killed him, distorting his little ear on the inside, and making him have "helicopter ears", because he lost feeling in one and can hardly hold it up even today, and it left a long thick scar as well. The pet shops hire inexperienced help too often, so do not always take their advice or consider them any sort of experts! We bought our bunny, at their and the packaging's suggestion, to help with the bunny's teeth needs to gnaw, a gritty cuttle-bone, like given to parrots, which made his gums bleed for the very first time in history! I took the product back and he finally got well. The one thing they can die from without cure is the Fusarium virus. "No one knows what causes it", (lucky for the vets who know how much we love the pet!). However, and more than "coincidentally" I believe, I learned that the "Fusarium wilt virus" on veggies is common and often overlooked, or not separated from the veggies well. I believe, regardless of what others say, that it is the cause of the disease of the same name in the bunnies, and always will, judging by what I've read on the comments, questions and answers online. Short haired house bunnies live about 12 years, only. But we have an 18 year old cat that still looks and acts like a big kitten! Who knows, if the saints don't rise, we might help the bunny to live a long life, the secret of which, I believe is to use a fresh daily, folded-once hand towel in the wire cage, keep cage clean, and love him often. Never feed a house bunny a single dead/darkened or wilted leaf or veggie/fruit. I hope this encourages someone to get a house bunny for a pet. They can't tell you when they need something, but ours sits on the place in his cage where we feed him, when we are late to feed. Our two precious pet mice actually place part of their little paper litter bundles inside their feeder when they see that we're late with their food. It's instinctual, I suppose? One of them is more tame than the other, but both are female and love each other, fuss over each other's food find, but share the exerciser and cage well. They eat only tiny scraps of most any food we have, even frozen peas, carrots, uncooked rice, or cookie crumbs, all equal to about 1 teaspoon per each mouse per day. They are more trouble than the bunny, because they are smelly and not too clean, marking immediately any part of their cage that gets cleaned. I keep a cheap air freshener in the room. However the clear plastic ball floor-exerciser we found they love and can't get lost when out of the cage. The mice cost $ 2.00 each, and the cage was given to us, like all the house bunny cage/parts. Yesterday we found a complete new Guinea pig cage, parts, book and housing on the curb. We may try to find another owner for it, though, or keep it in case one of the other pets dies or gets killed accidentally. The mice can get in the way when feeding and could get hurt, so I have to be especially careful with them. Another mouse we were given lived only a week because she had an injured ear, either from a bite or accident. Thank you for sharing all your wonderful advice on Bunny Care. I had a sweet little Dwarf Hotot Bunny named "Festus". He was all white and looked like he had eyeliner around his eyes. He was very loved & spoiled and lived about 5 years. He loved fresh spinach from my parents garden. What good care you give. You have some very lucky pets. I'm concerned about my pets when I get raptured outa here! They'll wonder where I went. And who'll take care of them.